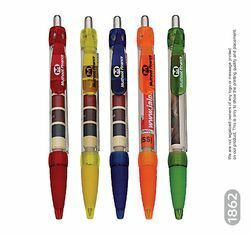 High quality banner pens , MASTHEAD. One of the most respected brands, we are a key player in providing high quality Banner Writing Pen, which are in demand all over the nation. The sophisticated quality standards maintained by us make it possible for us to include them effectively in our list of products. Further, we also offer these at cost-effective prices and deliver to clients in a pre-specified time frame. Among our wide range of products, we are offering a wide range of Promotional Banner Pens. Both side anner can be printed by offset technique. pen is with the rubber gripper. The arwork of both side can be of diiferent information and content. Pens are the most popular merchandise in the world. Banner pen can print 4C artwork on both sides of the pen. Promotional Banner Pens are plastic pens which have a built in retractable banner message inside each banner. 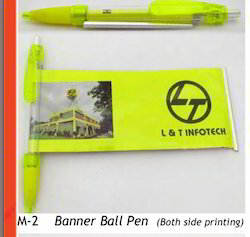 To furnish the ever increasing requisites of our customers, we are keenly successful bin presenting Banner Pens. In adherence with the trends taking place in this business realm, these are made in tune with the norms defined by the marketplace. Also, their fine quality makes these products highly cherished.